SOUTH BEND, Ind. (AP) Josh Adams’ night was cut short by an injured ankle but he still contributed more than enough to help No. 22 Notre Dame to its third straight lopsided victory. 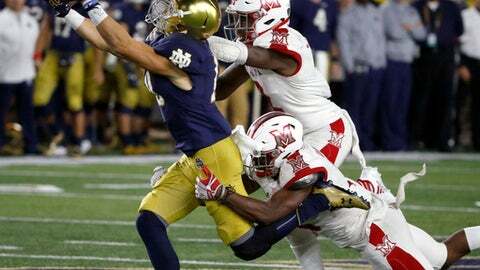 Adams had touchdown runs of 72 and 59 yards in the first half before leaving the game and Brandon Wimbush threw for three touchdowns and ran for another as Notre Dame beat Miami (Ohio) 52-17 on Saturday night. Adams, who entered the game as the No. 9 rusher in the country, led the Irish (4-1) with 159 yards on the ground despite the short night. Notre Dame gained 333 yards on the ground in all. Wimbush, who had his eighth rushing touchdown of the season in the first quarter, finished with 119 passing yards in three quarters and had 36 yards on 11 carries. ”I have another level to my game I haven’t hit yet, but I’m on my way to doing that,” said Wimbush. The Irish led the RedHawks 45-14 at the half, the most first-half points scored by an Irish team under Kelly. It was only the second meeting between the Irish and the RedHawks (2-3), two teams that were coached by Hall of Famer Ara Parseghian. The RedHawks’ Gus Ragland threw for 262 yards and a pair of first-half touchdowns to James Gardner, who had five catches for 115 yards. But they were overmatched from the outset by the Irish, who now have three consecutive lopsided wins after beating Michigan State and Boston College in the previous two weeks. Miami (Ohio): Though their record under Chuck Martin is only 13-29, the RedHawks have shown some improvement. They started last season 0-6 but Ragland returned from an injury to guide them to a 6-1 finish. Notre Dame: With its top three running backs – Adams, Tony Jones Jr. and Dexter Williams – questionable going forward, Notre Dame will need to find some healthy bodies. They face North Carolina next and then USC. Fourth-string running back Deon McIntosh had 47 yards on 12 carries on Saturday night, including a 26-yard TD in the fourth quarter. Notre Dame forced two turnovers in the game, giving the Irish 11 (five interceptions, six fumble recoveries) for the season. The Irish have turned the 11 turnovers into 70 points while the opposition has scored just three points off five Notre Dame turnovers (two interceptions, three fumbles). Miami (Ohio): The RedHawks return home next Saturday to play Mid-American East Division rival Bowling Green. Notre Dame: The Irish take to the road for the third time in four weeks when they visit North Carolina next Saturday.